Authentic Vintage Signed Autograph Photo - by BOTH! The friendship that existed between Frank Sinatra and Jilly Rizzo was legendary. 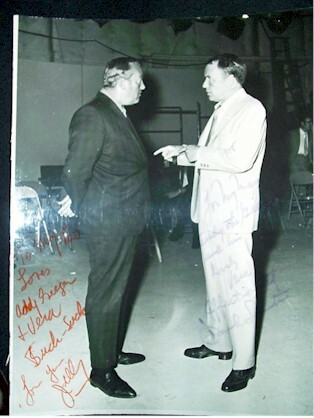 Here is a wonderful photo inscribed and signed by both. Frank writes, "To my man Andy the Geezer and his lovely Vera Affectionately Frank Sinatra". Jilly writes, " To my two loves Andy Geezer and Vera such such" (I think) "love you Jilly". Measures 9.5 by 7.5 due to a non professional trimming from what was probably an 8 by 10. Photo was once glued to a paper or cardboard backing, but no real harm done to the images or inscriptions. Unlike the VAST majority of Sinatra autographs offered on the autograph market and online auction sites, this is the real deal. A stunning photo and autograph of both. The first time we have seen both of their signatures on a single item!! And, with exceptionally written personal inscriptions to boot! ONE-OF-A-KIND!! You'll never find another like it! !